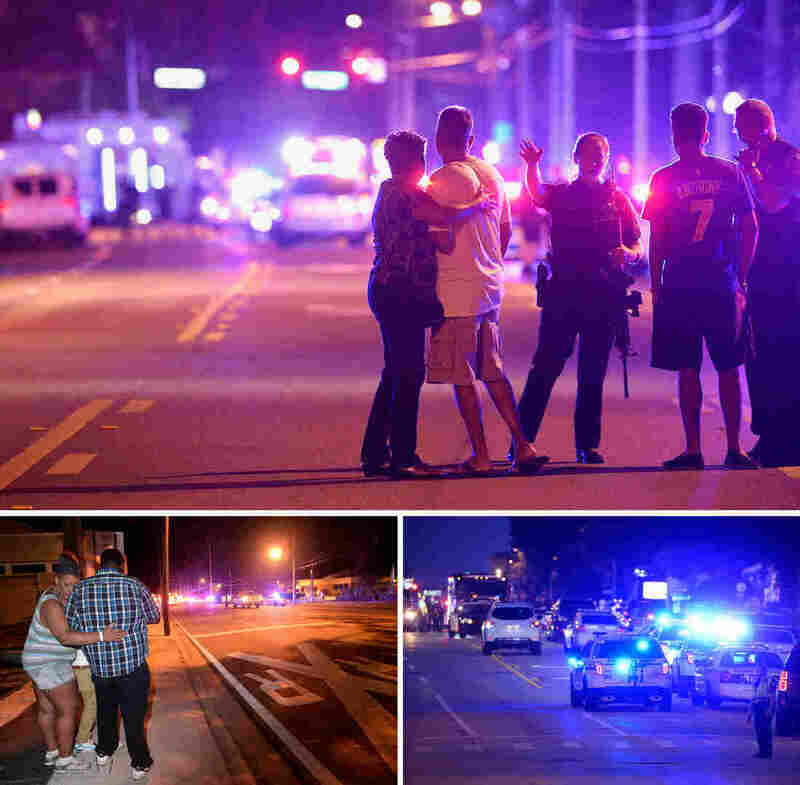 Orlando Shooting: What Happened At The Pulse Nightclub Attack : The Two-Way Thanks to police and FBI records and witness accounts, it's becoming clearer — if still impossible to comprehend — what transpired in Orlando in the early hours of June 12. Vigils have been held around the country for the victims of the Orlando nightclub attack on June 12. Thousands of people, including Jennifer Ware (right) and Mary Ware, took part in a memorial in downtown Orlando a day after the massacre. 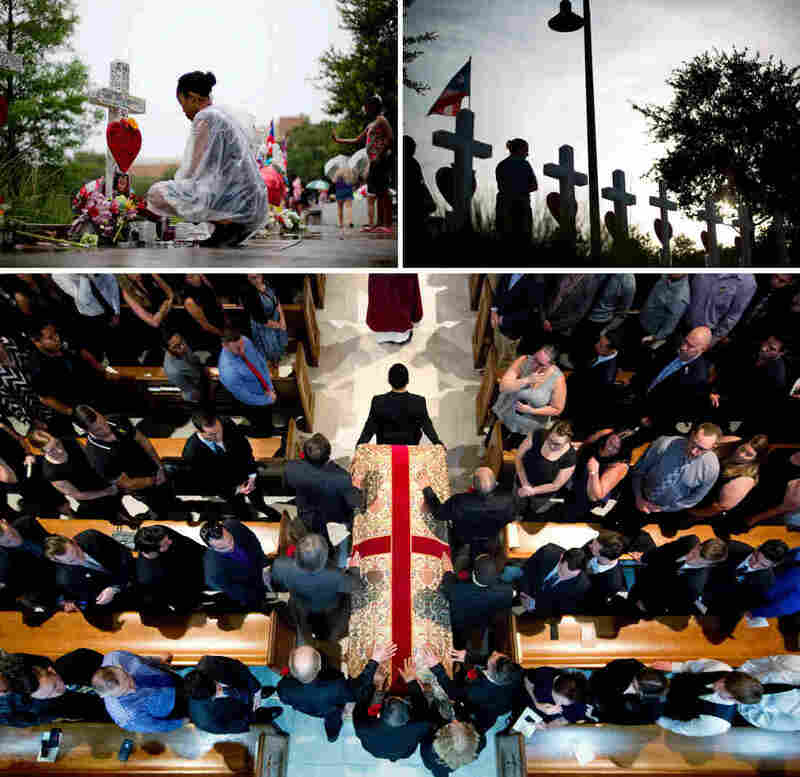 It's been two weeks since a gunman ended the lives of 49 victims and injured dozens of others at the Pulse nightclub in Orlando, Fla. As survivors heal and a community embraces the wounded and honors the dead, questions linger about what happened that night — and how the U.S. would respond after its deadliest mass shooting in recent history. Many details of the attack still aren't known. 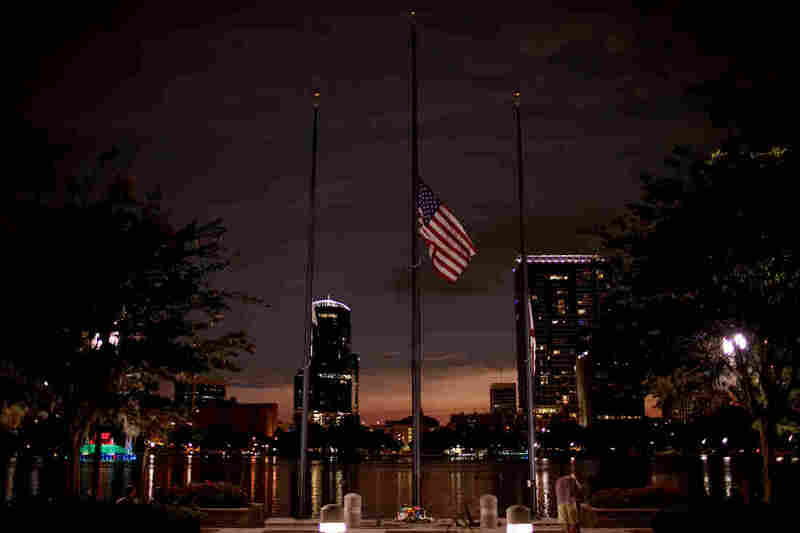 But thanks to police and FBI records and witness accounts, it's become clearer — if still impossible to comprehend — what transpired in Orlando in the early hours of June 12, between 2:02 a.m. and 5:15 a.m. ET. The weekend had already started on a tragic note, with the death on Saturday morning of a former contestant on The Voice. Christina Grimmie had been shot the night before as she signed autographs following a performance at an Orlando theater, and the city was struggling to come to terms with this violent crime. Saturday night was Latin Night at Pulse, one of the city's best-known gay clubs, and the place was packed with patrons both gay and straight, young and not-so-young, from the U.S., Puerto Rico, the Dominican Republic, Mexico and elsewhere, having a good time, dancing salsa and bachata. At 2:02 a.m., according to an FBI timeline, Orlando police received reports that multiple shots had been fired at Pulse. An off-duty officer was working there and "engaged in a gun battle" with the shooter, said Orlando Police Chief John Mina. "The suspect, at some point, went back inside the club, where more shots were fired," Mina said. Additional officers had arrived at 2:04 a.m. and entered Pulse four minutes later, exchanging fire with the attacker. At 2:09 a.m., a warning appeared on the club's Facebook page: "Everyone get out of pulse and keep running." Many did. But not everyone could. 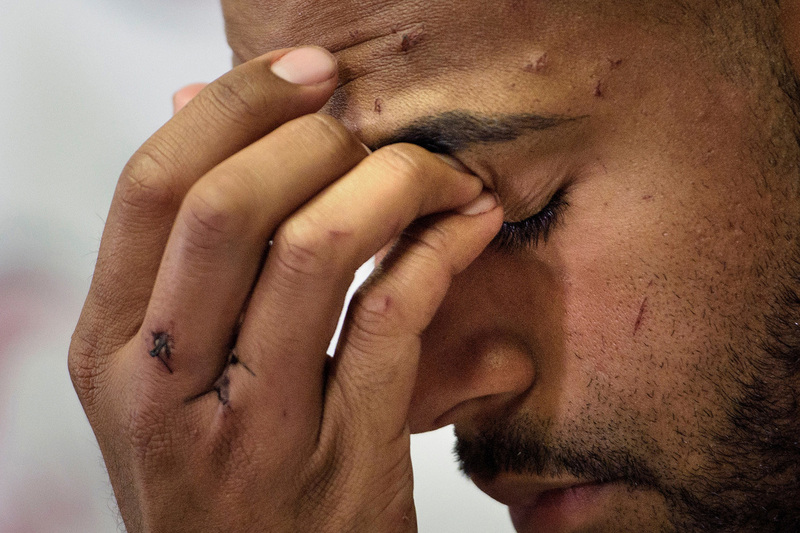 As soon as Angel Colon heard the gunshots, he and his friends ran for their lives. But Colon was shot three times. He fell and was trampled. All around him, he heard shots and cries for help. "I could just see him shooting at everyone and I can hear the [shots getting] closer, and I look over and he shoots the girl next to me," he said. "And I'm just there laying down and I'm thinking, 'I'm next. I'm dead.' "
Angel Colon was shot three times at Pulse. "I'm just there laying down and I'm thinking, 'I'm next. I'm dead,' " he said. "Just all hell broke loose, people running for the door, jumping over the gates," said Ray Rivera, also known as DJ Infinite, who'd been playing music that night in the patio area. He took cover behind his booth, shielded two others and was able to flee to safety. Some wounded clubgoers played dead on the dance floor. Others barricaded themselves inside bathroom stalls and, not wanting to speak, texted loved ones for help. The gunman paced around the rear of the club, laughing and shooting at bodies already on the ground. A SWAT team was called at 2:18 a.m.
At 2:35 a.m., about half an hour after the shooting began, the shooter made one of several 911 calls, according to the FBI. "I wanna let you know, I'm in Orlando and I did the shootings," the gunman told the operator during this 50-second call, according to a transcript released by the FBI. "What's your name?" the operator asked. "My name is I pledge of allegiance to Abu Bakr al-Baghdadi of the Islamic State." At 2:48 a.m., the gunman — whose name was Omar Mir Seddique Mateen — spoke with crisis negotiators from the Orlando police. He had a second conversation with them at 3:03 a.m. and a third at 3:24 a.m.
Mateen identified himself as "an Islamic soldier," according to the FBI, and threatened to detonate explosives, including a car bomb and a suicide vest — the kind "used in France," he said, referring to the terrorist attacks in Paris last November. Searches inside and outside the club failed to turn up these items, investigators said. Mateen is also believed to have spent time online during his siege of the club, checking Facebook and searching for "Pulse Orlando" and "shooting." He called a friend. He texted his wife. At 3:58 a.m., the Orlando Police Department's Twitter account warned residents to stay away from the area. At 4:21 a.m., police cleared a way for some people trapped inside the club to escape by dislodging an air conditioning unit from a Pulse dressing room window. As clubgoers were being rescued, they told police the shooter had threatened to put bomb vests on four people within 15 minutes. As 5 a.m. approached, those inside had been trapped for nearly three hours, some wounded and bleeding, calling police from their cellphones and pleading for help. 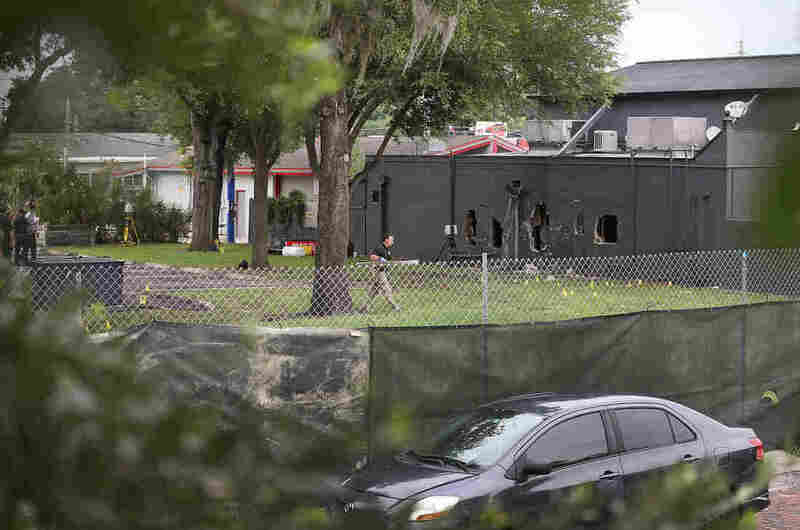 Police used explosives to try to breach the exterior cinder block wall of a bathroom where a dozen or so people were hiding, near another bathroom where Mateen had holed up with several hostages. "I could see his feet, like scooting back, scooting back, scooting back, as he heard the police outside," said Patience Carter, one of the hostages with Mateen. At 5:02 a.m., a SWAT team and the Orange County Sheriff's Office Hazardous Device Team "began to breach [the bathroom] wall with explosive charge and armored vehicle to make entry," according to the FBI. "And the last thing that I heard before the police said, you know, 'Move away from the walls' — because, obviously, they were about to bust through again — [the shooter] said, 'Hey, you,' to someone on the floor inside the bathroom," Carter said. "And shot them. Shot another person, and then shot another person who happened to be directly behind me." When the wall was broken, hostages began to emerge — and so did Mateen. "The suspect came out of that hole himself, armed with a handgun and a long gun," Orlando's police chief said. Mateen began firing at police, and they fired back. An officer was hit in the gun battle but was saved from serious injury by his Kevlar helmet. At 5:15 a.m., police reported the shooter was down. A police tweet confirmed Mateen's death at 5:53 a.m., just before sunrise Sunday morning. The 29-year-old gunman was a U.S. citizen, born in New York in 1986. His parents moved to New York from Afghanistan in the 1980s, and eventually, the family relocated to Port St. Lucie, Fla. Mateen's last known residence was in Fort Pierce, in St. Lucie County — about a two-hour drive from Orlando. Investigators said Mateen legally purchased the two weapons he used at Pulse, a Sig Sauer MCX assault-style rifle and a handgun, in Port St. Lucie in the week before the attack. A third weapon was found in his vehicle. According to public records, Mateen had possessed a valid firearm license since September 2011. He was also licensed to be a security officer, working most recently for the global security company G4S, where he'd been employed since 2007. FBI Director James Comey said Mateen had been investigated in 2013 and again in 2014. In May 2013, Mateen claimed to have ties to both al-Qaida and Hezbollah, sparking a 10-month inquiry that sought anything tying him to more substantial threats. He was placed on a watch list when the investigation began, and taken off when it was closed in March 2014. In July 2014, FBI agents again looked at Mateen as they investigated anyone with possible ties to Moner Mohammad Abu-Salha, a U.S. citizen from Florida who blew himself up in a 2014 suicide attack in Syria. "No ties of consequence" were found, Comey said. Mateen was married twice and had a 3-year-old son. The gunman's father, Seddique Mir Mateen, condemned the attack. "I apologize for what my son did. I don't know why he did it," he told NBC News. "He is dead, so I can't ask him. I wish I knew." 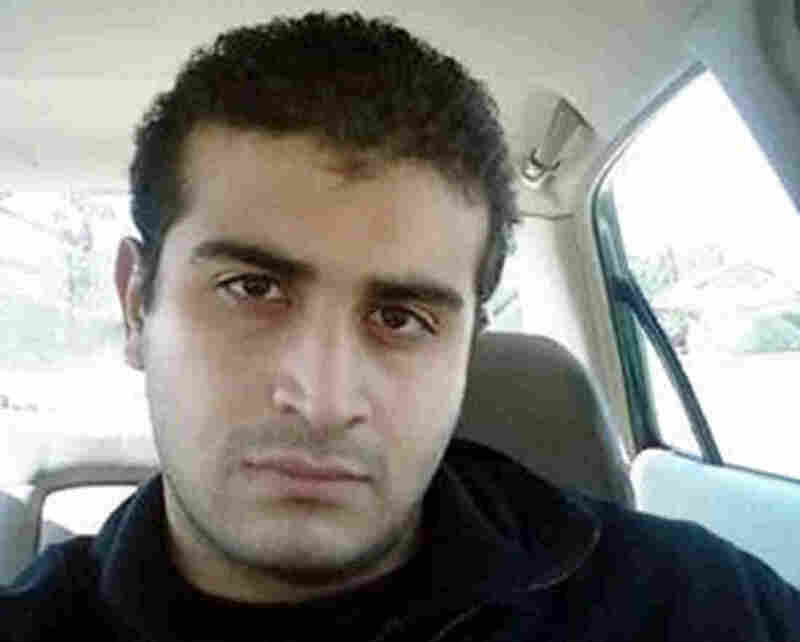 The elder Mateen said his son had become angered recently at the sight of two men kissing. But multiple media outlets reported that some Pulse regulars recognized Mateen and said he had frequented the nightclub as a patron. At least two men said they interacted with Mateen on gay dating apps. But "the FBI has found no evidence so far to support claims by those who say Mateen had gay lovers or communicated on gay dating apps," according to the Los Angeles Times. Mateen's first marriage ended in divorce. His ex-wife, Sitora Yusifiy, said he was an abusive husband. A grand jury is looking into what his second wife, Noor Salman, might have known about her husband's plans to target Pulse and whether she should face charges in connection with the attack. Mateen texted Salman as the attack was underway. Mateen's motivations remain unclear. Although he claimed allegiance to ISIS, he also said during his 911 conversations that the Tsarnaev brothers, who attacked the Boston Marathon in 2012 (but did not affiliate themselves with ISIS), were his "homeboys," the FBI said. His father has insisted the attack had "nothing to do with religion." "Around 2:00 [a.m.] or so, we got word that there were some shootings," Dr. Gary Parrish, medical director of the emergency department at the Orlando Regional Medical Center, told reporters on June 14. "But we didn't know quite what was about to hit us." Patients suffering wounds to the chest, pelvis, extremities and abdomen began flooding into the emergency room shortly after 2 a.m., said Dr. Chadwick Smith, a surgeon at the hospital. The wounded were brought in by the "truckloads and ambulance loads," doctors said. So much blood was lost that the hospital exhausted its entire medical supply. More had to be brought in from nearby hospitals. Operating rooms, Smith said, were cleaned hastily between surgeries, in about a minute — again and again and again. "We are dealing with something we never imagined," Orlando Mayor Buddy Dyer tweeted the morning after the attack. But, he said later, "We will not be defined by the act of a cowardly hater. We will be defined by how we respond, how we treat each other." Vigils around the country and the world have honored the memory of the victims. On Friday, Florida's governor and Cabinet members placed 49 state flags for the victims on the lawn of Florida's historic capitol in Tallahassee. Meanwhile, gun sales increased in the days following the massacre. A Florida congressional candidate announced a contest on Facebook to give away an AR-15 rifle, similar to the weapon Mateen used, on July 4. In Washington, D.C., the Senate voted on four gun-control measures. All four failed. Dr. Joshua Corsa, a surgeon who was on duty at the Orlando Regional Medical Center the night of the attack, has vowed to continue wearing the bloodstained shoes he had on that night, until every wounded victim is discharged from the hospital. On Thursday, 11 days after the attack, Pulse's owner hosted a "Latin Night" street party for employees, patrons and friends, with music blaring and a dance floor in a restaurant parking lot. A thousand people showed up. "It's not a party, really, but I feel happy to see everyone," said one Pulse patron, who'd survived after hiding in a bathroom during the June 12 attack. "We needed this." The section of Orlando's Orange Avenue near Pulse has reopened for business and traffic, though the club itself remains closed for now. 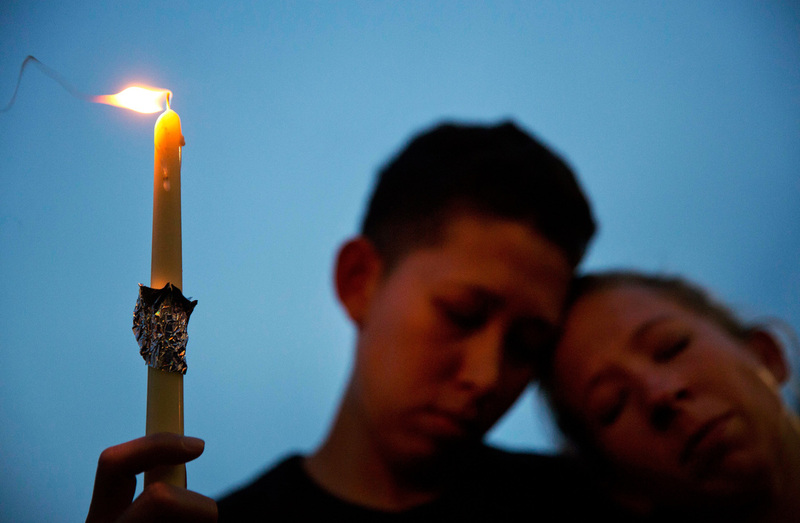 "We can't feel normal yet after what happened," a Pulse employee told the Orlando Sentinel. But life is returning to a scarred city.